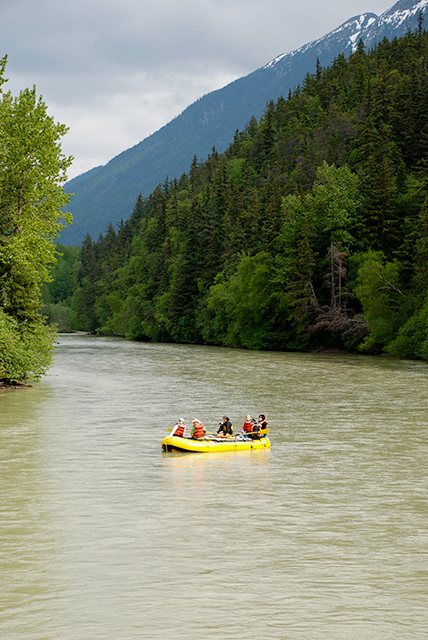 Visit one of the most scenic regions in Alaska, the Northern Lynn Canal on this multi-sport adventure! 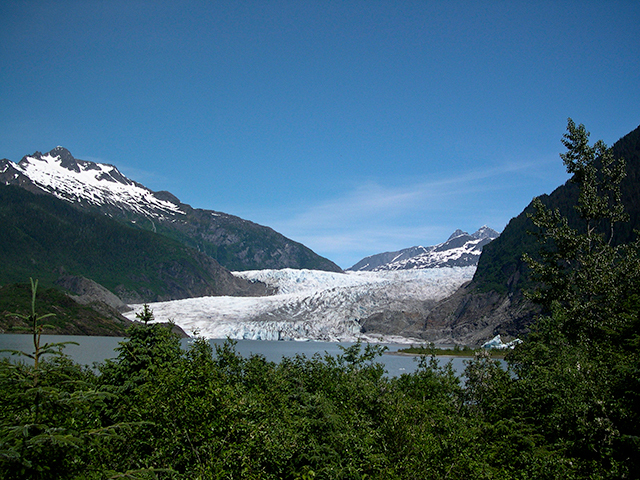 On this tour you stay and adventure in the scenic coastal communities of Juneau, Haines and Skagway. In each town you bike, hike, kayak, raft and visit cultural sites. The Alaska State Ferry and private ferry service transports you from one town to another. This is the way to cruise Southeast Alaska. A multi-sport trip in comfort and style! 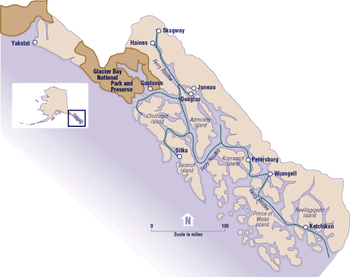 This adventure utilizes Alaska'a unique Marine Highway system for scenic cruising between the three coastal communities of Juneau, Haines, and Skagway. This is the perfect introduction to life in Southeast Alaska, where the mountains thrust to the skyline straight from the glacial waters of the fjord and the rain forest beckons you to walk on a carpet of moss under its canopy. By day you ride along scenic roads to picturesque picnic spots in each town. In addition to great biking, you get to enjoy other outdoor activities such as sea kayaking, hiking, rafting, and cultural education. In Juneau you bike to Douglas Island, walk in the rainforest and paddle on the glacial fjord with a view ot the Mendenhall Glacier. 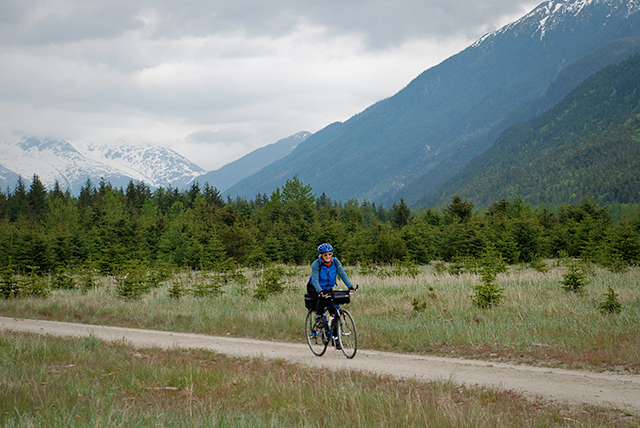 In Haines you explore the Chilkat Bald Eagle Preserve by bike and raft then bike and kayak on pristine Chilkoot Lake an area known for abundant wildlife. In Skagway you relish in the Gold Rush history as you board the White Pass and Yukon Route narrow guage railroad for your trip to the summit then bike back down the White Pass. Your final day takes you the ghost town of Dyea for a bike ride through the rain forest, a hike on the historic Chilkoot trail and a relaxing raft float down the Taiya River! We have selected the finest local inns and bed and breakfasts for you to stay in. Enjoy our northern hospitality at these quaint and historic lodgings. You dine at some of Southeast Alaska's finest eating establishments for breakfast and dinner and recharge your day with our scrumptous picnics during the lunch hour. You are escorted by one of our senior local guides, who informs you about the rich history and ecology of the region during your trip. 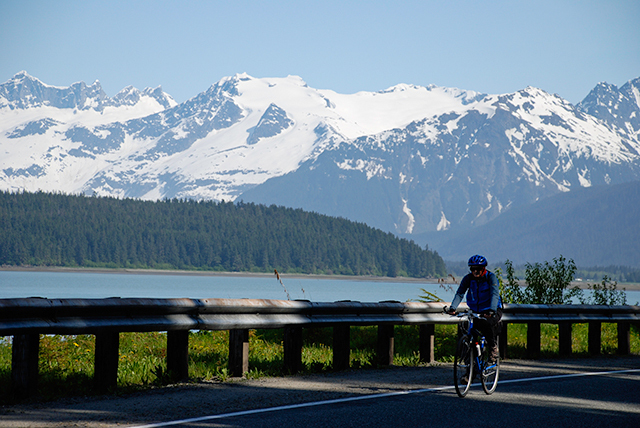 This tour is a perfect sampling of Southeast Alaska, combining biking and other outdoor activities, comfortable lodging and dining, and a moment in your life to relax on an unforgettable journey. Our easist tour rating, suitable for a wide range of interests and abilities. Combines biking with other outdoor activities such as kayaking, rafting and hiking. Comfortable lodging and dining at local establishments and restaurants. 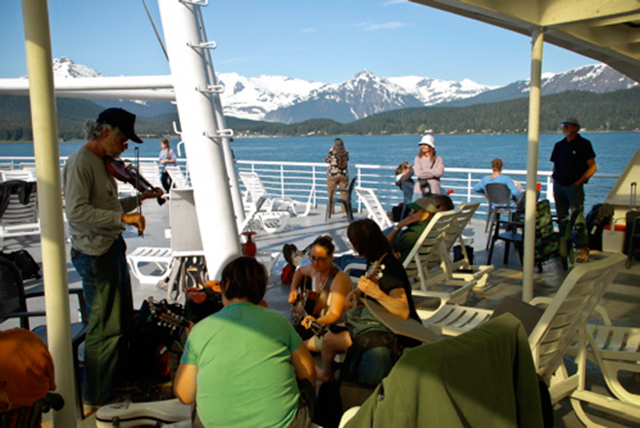 Travel on the Alaska Marine Highway ferry system. Notes: Price includes hybrid touring bike, helmet, listed activities, lodging and meals from day 1 dinner through day 9 breakfast. Guests must be confident riding a bicycle with hand brakes. Helmets are required. A passport and other necessary immigration documents are required. For more information about travel to Alaska and recommended gear see our trip preparation link. The following daily itinerary is an outline of our activities. The schedule may vary due to weather and other unforeseen circumstances. Please contact us with any questions. Day 1 - Arrive in Juneau, Alaska. Your guide picks you up at the airport and transports you to the Silverbow Inn. After you unpack and freshen up you meet your guide for a tour orientation, bike fiting and a short ride around town followed by dinner. Day 2 - You depart on a morning bike ride to the north end of Douglas Island for a walk through the forest to the beach. 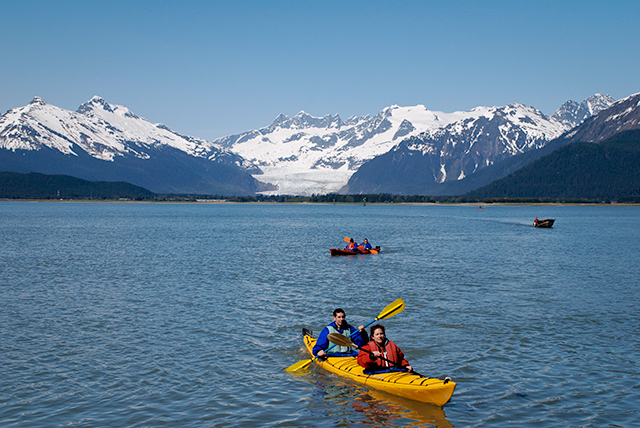 After lunch you slip into a stable sea kayak for a paddle around the cove with views of the Mendenhall Glacier. Evening options are a town walk followed by a tram ride up Mt. Roberts for an amazing view! Day 3 - You check out of the Inn, then bike to Auke Bay, making scenic stops along the way before your ferry ride to Haines. Dinner is served onboard while cruising the Lynn Canal, North America’s longest fjord. Arriving in Haines four hours later, you check in to the Hotel Halsingland. 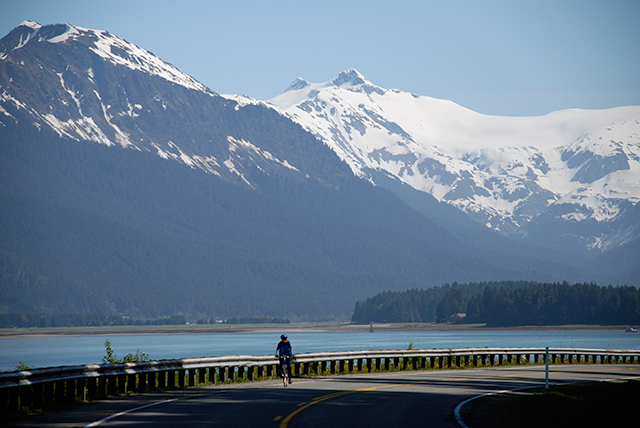 Day 4 - On your first day in the picturesque town of Haines, you bike along the Chilkat River. 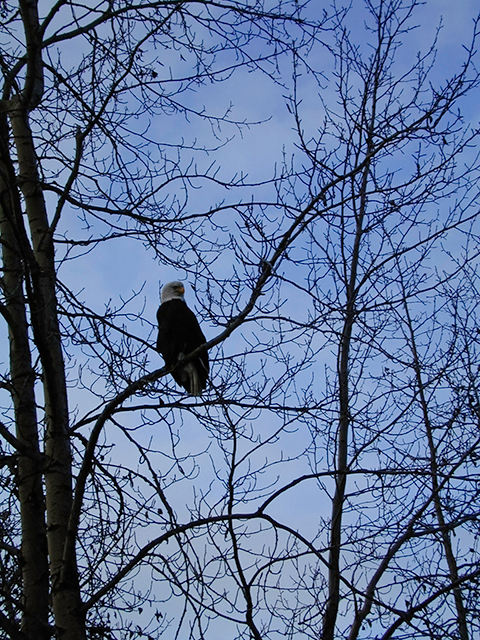 After lunch your guide takes you on a raft float through the Chilkat Bald Eagle Preserve, spotting for wildlife along the banks of the glacial river. On your return to town you stop for a cultural tour in the Tlingit Village of Klukwan. Day 5 - In the morning you bike to glacial-fed Chilkoot Lake. At the beautiful emerald lake, you exchange your bicycle for a sea kayak. After a brief orientation, you glide silently along the shore, spotting for bear, moose, eagles, and other wildlife. The afternoon is spent on a short coastal hike to a viewpoint or relaxing at your B&B. 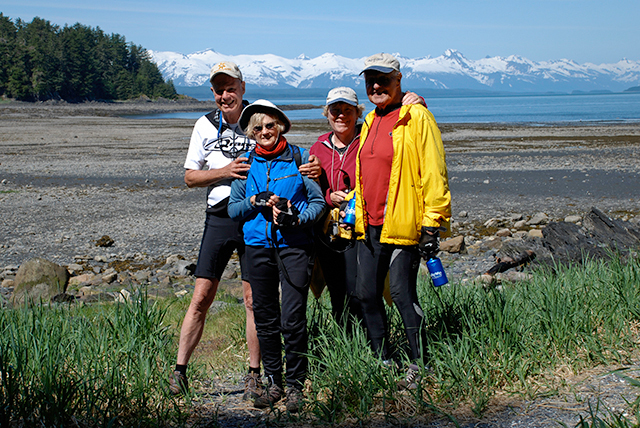 Day 6 - Your day starts with a short bike ride along the Lynn Canal to a trailhead. You hike through the rainforest to a viewpoint where you take in the majestic scenery of the glacial fjord. In the afternoon you board the fast ferry to Skagway and check in to the HIstoric Skagway Inn. You can tour town by foot or bike, followed by a 'Days of 98' show. Day 7 - You board the historic White Pass & Yukon Route narrow gauge railroad for a trip over the summit to Fraser Station in British Columbia, Canada. 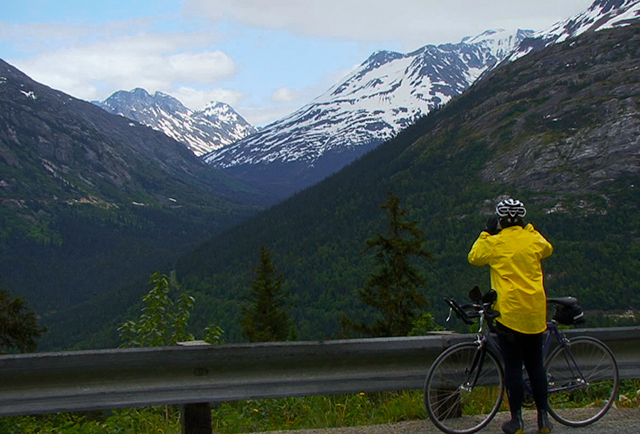 From there you cycle back to Skagway, descending 15 miles from the 3292’ summit of the White Pass to the sea. The afternoon is spent hiking on your own to a lake or relaxing at the B&B. 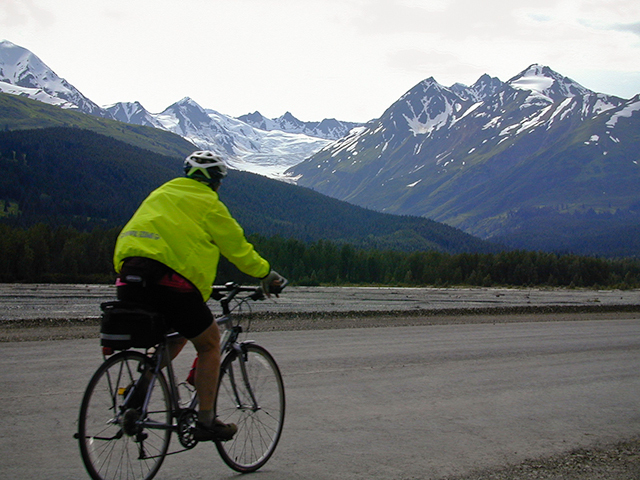 Day 8 - Your day starts with a bike ride from Skagway to the historic town site of Dyea. You explore the tidal flats and rainforest trails on your bicycle. You then hike two miles of the Chilkoot Trail followed by a leisurely raft float down the Taiya River. The afternoon is spent with a Park Service Interpreter on a town walking tour, followed by a movie about the Gold Rush. You may also choose to relax at your B&B and savor the memories of the past week. Day 9 - After breakfast you can go shopping or sightseeing before we take you to the airport or ferry terminal for your departure home. You may choose to keep the adventure going in Alaska! The Silverbow Inn in the center of downtown Juneau, is a boutique hotel that blends Juneau's unique history with contemporary amenties. Eat breakfast at the Silverbow Bakery and Restaurant and visit the hotel's cinema and art gallery. The Hotel Halsingland is Haines' premier hotel. Located in historic Fort Seward, this Victorian hotel offers modern accommodations in historic surroundings. Dine at the elegant Commander's Room or at the Officer's Club Lounge. At the Skagway Inn Bed & Breakfast host Innkeepers Karl and Rosemary Klupar provide warm hospitality as they invite you to enjoy their historic Victorian Inn. Once a Gold Rush brothel, guest rooms are named after the ladies who worked in "Paradise Alley." Enjoy fine dining at Olivia's restuaruant. This is a sample of the type of accomodation we use on this trip. The exact locations might differ depending on availability and unforseen circumstances.